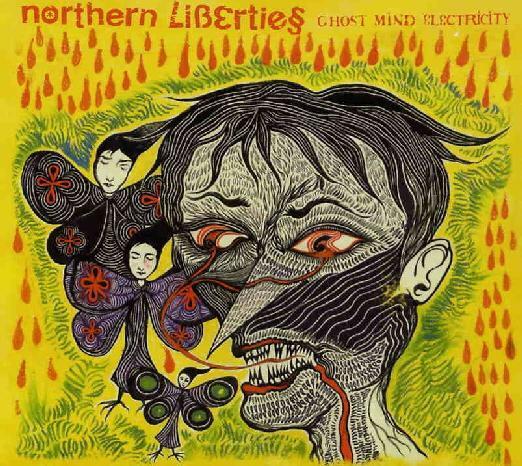 This engagingly eccentric Philadelphia band forges its own unique musical idiom on Ghost Mind Electricity, a collection of 12 songs that explodes with the aggression and velocity of punk but that haunts the brain with the hallucinogenic intensity of psychedelia. Lead vocalist Justin Duerr howls with the primal ferocity of a young, cocksure Iggy, while brother marc demolishes his drum kit at breakneck speed. Bassist Kevin anchors both with his nasty, fuzz-drenched bass, which he often plays with all the power and drive of Johnny Ramone, hence perhaps the reason why Northern Liberties play sans guitarist. The group’s post-apocalyptic vision and fractured, surrealistic lyrics (sort of like an unholy alliance between Joy Division, Wire and Morphine) put them far above your garden-variety smash mouth punk outfit, though. Songs like “Controlled by Voices from Beyond” and “Psionic Sorcery Song,” with their cryto-Lovecraftean doom-mongering, cut through the backbrain like a power saw on overload. The non-stop energy the group consistently generates and sustains on the chilling “Emerald Ghost Garden” and the blazing “Silver Fire” more than justifies any compositional deficiencies the songs themselves might display. These anthems for the holocaust are all strangely compelling and deserve a wider audience than the group has up to this point attained. Northern Liberties’ psychedelic punk is both innervating and thought-provoking and is a welcome respite from the thud and gore tedium of thrash.